Professor David Day and workshop attendees discuss sources of power. For many of us, leadership is nothing but a confusing concept that leaves us feeling perplexed when we don’t fully understand its relevance. It can also leave us feeling guilty when we don’t frequently implement it in our daily lives. We often underestimate our ability to lead due to insufficient exposure to formal leadership roles, unmet age requirements, or even lack of experience. However, you and I both have the potential to be successful leaders right now! On February 2, KLI Academic Director and Leadership Professor David Day conducted a leadership development workshop in conjunction with the Soll Center for Student Opportunity called “Influencing and Leading Without Formal Authority,” which focused on the art and science of getting people to say “yes” to your requests. For many of us students, this is a welcome relief because we don’t always have easy access to formal leadership positions, excluding the positions offered in clubs and organizations existing on campus. Professor Day’s statement showed me that leadership development starts when you are ready. So why not now? Good leaders can ethically persuade others to their viewpoints. Professor Day noted three achievable outcomes when trying to persuade someone: resistance, compliance, or commitment. Resistance occurs when a person opposes your request or influence attempt. For example, trying to convince your parents to buy you the latest iPhone upgrade, but they say “no”. Compliance occurs when a person agrees by doing what is asked. If we continue with the same example, then your parents would agree to purchase the iPhone upgrade. Finally, commitment occurs when a person enthusiastically agrees to the request, which could equate to a buyer happily agreeing to make a purchase. In this instance, it would amount to your parents physically purchasing you the iPhone upgrade. Yay! It’s clear that resistance is the least desired outcome, so how do we increase the amount of compliance or commitment our requests receive? First determine if you desire compliance or commitment, and then select which common sources of power and principles of persuasion are necessary in your influencer strategy. As a freshman student, I sometimes feel as though my skills and professional value get short changed due to my age. Nor my or anyone else’s value or leadership potential should ever be determined merely by age alone. Many sources of power and leadership exist. So if we cannot access formal authority, then we can use other sources. For example, if you comprehend specific course material well, then consider tutoring for that subject. Once people realize your ability to solve one of their problems, they will be more likely to view you as an expert. As a result, your reputation as an influencer will grow significantly, causing more people to request your skill set in order to solve their problems. Last semester, I tutored students in calculus 1 and 2, many of whom disliked their professor’s style of teaching or the dynamic of group tutoring sessions. It started by helping friends with practice problems to hosting large review sessions for midterms, which then lead to becoming an official math tutor—bear in mind that I am only a freshman. The moral here is that skills are an opportunity for you to exercise your expert leadership, while remembering the benefits offered by the principles of persuasion. A lot of the time, we approach situations looking to receive a benefit rather than give without expecting anything in return. Science shows that people repay in kind, so why not make giving a part of your influencer strategy? One nifty tip that Professor Day shared with us is how to properly close a conversation after lending someone a helping hand. Instead of saying, “don’t worry about it” after helping someone say, “if the roles were reversed, I know you’d do the same for me.” This instills a sense of obligation in the person rather than letting them off the hook entirely. People want more of what they don’t have. For example, when online stores announce that a limited supply remains in stock, people feel more inclined to make a purchase. We can adopt similar language when formulating persuasive propositions by telling people what they will lose rather than what they will gain from agreeing to your request. It is not unethical to frame things in a way that will grab people’s attention. Many college students feel unqualified to hold positions of authority due to lack of experience or formal leadership roles. People defer to experts, and we are all experts in something; formal leadership doesn’t need to validate this fact. You can also build your perceived authority and expertise by first mentioning weakness in your request and then showing how the strengths behind the request will more than make up for any weaknesses. In this way, you not only can show you know what you are talking about (expertise) but also build trust with the other person. When asking people to commit, get them to commit verbally or in writing. According to Professor Day, “people live up to what they write down.” This will make people much more likely to follow through on their promises. Research shows that we tend to cooperate with people who are more like ourselves. Always look for similarities, give genuine praise, and provide compliments when attempting to influence others. People follow the lead of similar others. It is a natural human instinct to fear being left out. Ethically exploit this fear by establishing the successful majority and showing the person you are influencing where he or she is currently situated in relation to the majority. Many students have expressed to me sentiments of bewilderment in regards to understanding the underlying purpose and value of KLI. 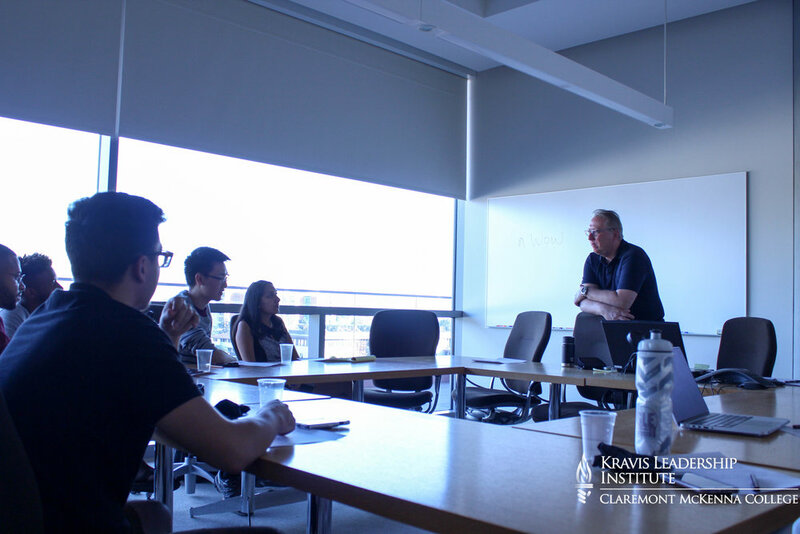 As a KLI student employee, I found this workshop to exemplify one aspect about what KLI actually does. Ignoring the obvious leadership aspect, it enhanced student’s ability to achieve success in the real word, which is relevant and applicable to students across all majors. At the end of the day, we all have the ability to lead successfully, either in formal or informal capacities. However, this mindset begins with us believing it for ourselves. “If we don't think we are leaders, if we don't think we are powerful, then when we get into situations where successful leadership is required, then we are at best tentative,” said Professor Day, who then implemented a piece of his own advice. “I’ve invested my two hours into this workshop, but I know if the roles were reversed, you would do the same for me,” he jokingly concluded the workshop.